It wasn’t an easy decision to leave Church in Bethesda and I’ve written some things about my entrance into the Episcopal Church, one the strongest factors that led to my resignation. And for the first time in a long time, I’m back in the role of being a member of a congregation without any leadership or teaching responsibilities. Yes, I’m pursuing ministry options within the Episcopal Church, and I hope to serve our new Church family. I’ll even go ahead and say that I hope and pray that I am able to serve the Episcopal Church and our world as an Episcopal Priest, but it’s all up in the air for a while longer. For now I find myself outside of a role that I have served in for a long time, one I am realizing that I have internalized and made who I am as much as what I do: Shepherd. As a Pastor, a Shepherd, my role was to come along side other members of our community and dig into scripture, experience life’s best and worst, and to faithfully make sense of it all together. I prayed for and with others. I served others and with others. I weekly spoke and wrote about scripture, God and faith. I creatively pursued ways within community to faithfully hear and follow God’s Spirit and footprints across our dusty globe. I painted. I played my djembe. I solemnized weddings and I officiated funerals. Talking of shepherds and sheep might sound a bit off-putting to you, as if we’re talking about being a leader with a bunch of followers. The reality is that a good shepherd is as often following the sheep as leading them. (I often saw this when we lived in East Africa.) A good shepherd is serving the sheep and working to meet their needs more often than the sheep might be serving the the needs of the shepherd. Of course, we’ve all known an egotistical church shepherd who wields a wicked stick, but that is not an image of a scriptural pastor nor the example of the Good Shepherd, our Lord Jesus Christ. These most recent reflections are not necessarily about the people we left behind at Church in Bethesda, good people we miss and love dearly. I’m not really writing about them, but about life after them. I’ve become a shepherd without any sheep. I don’t have a group of people for whom I have committed to follow, lead and serve as pastor and shepherd. We do have a congregation, and it’s filled with wonderful folks. I’ve been able to preach a few times on Sunday nights, and Teresa and I have been asked to teach a teen class on Sunday mornings in the Fall. But these are more in the doing part of me as shepherd than the being part. That being part is what I’m missing. It’s the prayerfully dreaming and the vision casting of ways to enact our faith, within our community and in the world. It’s the circle of deep care around a group of people in which I share and breathe. It’s making art for them and making art together, and the prayerful preparation before the making of that art. One thing that is really getting to me is having messages well up inside of me, and no venue to share. It’s having dreams and images in my heart and no canvas on which to begin making them reality. It’s the realization that it’s much more difficult to be patient in this liminal space than I expected. My reflections are multifaceted, but I wanted to capture a few ideas while they are still crystallizing in my mind. 1) I’m still feeling very blessed and happy in the Episcopal Church. Our experience at St. John’s Episcopal Church has been wonderful and we’re happy to be there. And my recent joy at Missional Voices is still fresh. We have a beautiful, diverse faith family in the Episcopal Church and the Anglican Communion, and I’m happy it’s our home. 2) I need to take my impatience and feelings of loss and channel them into prayer and devotion. The thing about liminal spaces is that with growing anxiety and impatience, depression and hopelessness are too often the natural course. It’s all too easy to lose touch with faith and forms, practices that instill hope and reinforce conviction. Choices must often be made and remade as life’s journey moves into new territory. 3) I need a community in which I am a sheep and a shepherd, wherein I lead and follow and grow and share with some other souls. This is probably going to be alongside our membership and participation at St. John’s, but never instead of St. John’s. I shouldn’t be just waiting for what is coming next in my religious life and vocation; it’s a good time to start dreaming and realizing what comes next. As promised, I doubled the usual length of a blog post… sorry about that, guys. But if one of these three reflections sounds like something you’d like to explore with me, then let’s get coffee and talk. Let’s get together and talk about faith without judgment, diversity without anger, peace without war and love for our enemies… lots of good Jesus stuff. God is good. God is good all the time. This entry was posted in Just Life, Pastoring, preaching and tagged Pastoring, preaching, Sheep, Shepherd. I want to be your pastor because you intrigue me. Sounds kinda selfish when I say it like that, huh? But it’s the best way to say it. I’m interested in you, your story, your likes and dislikes, your talents and your experiences. And I’m willing to listen. We miss something very important to being human and being a Christian when our religion and spirituality lead us to tell others what to be interested in more than listening to what interests them. Now, I will at times fail at this very thing I believe so deeply. There will be times I’m caught up in being busy, and I will fail. There will times that I am so interested in my own interests, so excited to tell you what I’m thinking, that I will fail… I am a “preacher” after all. What I ask, no… what I invite you to do is break in on me. Maybe even, well… shush me. Just do it with some grace and some love. Give me a chance to hear you and understand. I might be distracted some days, but I still want to get to know you. Please be you, and I’ll try to be me. When we get the authenticity right God’s amazes us, and I’m excited to see where we might go. It’s always been our struggle, to quit bringing God some manufactured gift, some consolation prize, instead of the reality of our open selves, “Open my lips, Lord, and my mouth will declare your praise. You do not delight in sacrifice, or I would bring it; you do not take pleasure in burnt offerings. My sacrifice, O God, is a broken spirit; a broken and contrite heart you, God, will not despise.” Psalm 51:15-17. If I can serve you today, as a pastor and a friend, just let me know. This entry was posted in Just Life, Pastoring and tagged Community, Knowing, Listening, Other, Pastoring, You. I’m not only trying this month to write about my belief in your goodness and my desire to be your pastor, but I’m also reading. One book I’m spending time with is Eknath Easwaran’s “Original Goodness,” his book on The Beatitudes from the Sermon on the Mount. His book “Love Never Faileth” is also amazing. Here’s a just a snip that I read while on a long walk, yesterday, and a doodle I did this morning in my prayer and reflection time. “When I was growing up in South India, just half an hour’s walk from my home was a lotus pond so thickly overlaid with glossy leaves and gleaming rose and white blossoms that you could scarcely see the water. One of the Sanskrit names for this most exquisite of flowers is pankaja, “born from the mud.” In the murky depths of the pond a seed takes root. Then a long, wavering strand reaches upward, groping through the water toward the glimmering light above. From the water a bud emerges. Warmed by the sun’s rays, it slowly opens out and forms a perfect chalice to catch and hold the dazzling light of the sun. Be blessed in your day, my friends, for you are good. 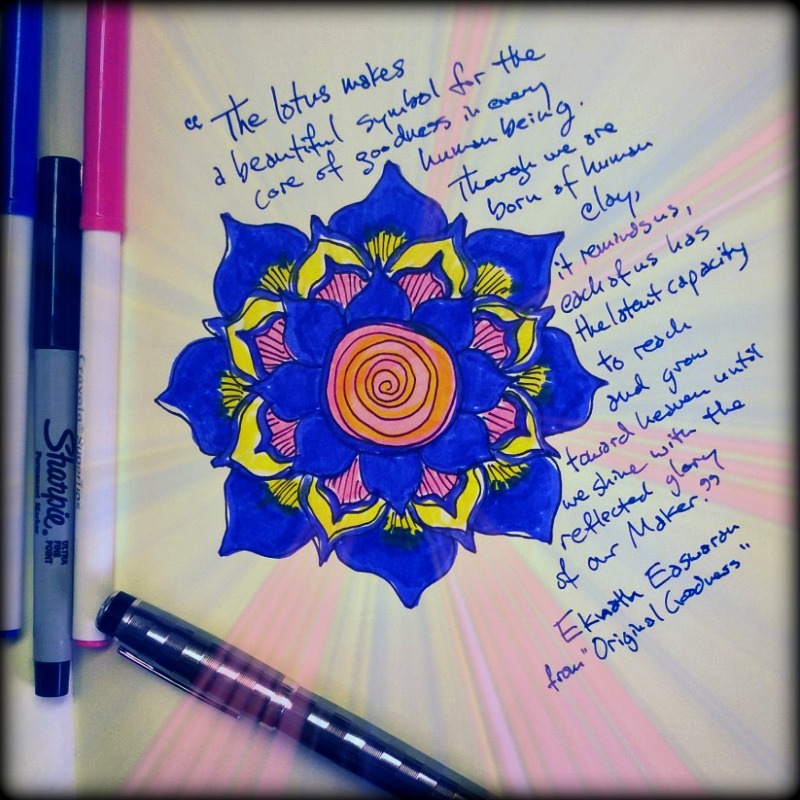 This entry was posted in Art, Just Life, Pastoring, Prayer and tagged Goodness, Lotus, Original Goodness, Pastoring, Reading. I’m sure I’ve blogged enough over the years about my belief in God and Christ… but I don’t think I’ve ever actually blogged about how much I believe in you, you my friends, you my family, you my neighbors. I believe in you. I don’t believe in you in some silly way that romanticizes your chances at becoming President one day. Instead, I believe that you are good. You are beloved. I believe you should be you. I do not believe it’s my job to change you. I believe in God in you. I believe in God’s love for you. I do not believe God’s love will ever leave you. I believe in your wisdom. I do not believe your mistakes define you. Jesus believes enough in you, in us, that he once described us as salt and light. The Psalmist once described us as a little lower than God, just a little. Don’t worry, I’m not thinking we’re at all close to dethroning the Almighty. I am however pretty excited about sharing some life with you. Let’s do this! This entry was posted in Just Life, Pastoring and tagged Belief, Pastoring, You.